On Monday, Jan. 30, the University of Rhode Island College Republicans made progress in their pursuit for official recognition after the Student Organization and Advisory Review Committee, or SOARC, agreed to submit a bill calling for their recognition as an unfunded student organization to the URI Student Senate. 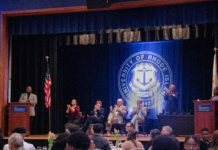 After being derecognized by student senate two years ago, due to lack of membership and absence of leadership, Edward J. Tarnowski, a freshman business and political science major and the President of the URI College of Republicans, went to the student senate with hopes of restoring this organization. Tarnowski’s recruitment process for the club began this past winter with the creation of the URI College Republicans Facebook page, which initially received a small amount of interest from URI students. The interest increased after Tarnowski spoke to students in two of his political science classes about his organization. This opportunity to have political representation on campus has helped the membership increase to 30 people. Members within the club promote “the values of free market principles, limited government freedom, and equality of opportunity with all,” Tarnowski said. He believes that the success of this country is dependent on the continuation of these ideas. Avi Shrivastava, a freshman business major and a member of the URI College Democrats, said that he is happy that the College Republicans are returning to campus, and reached out to Tarnowski about working together to help students register to vote. One of the first issues that the College Republicans hopes to improve is the Red Light rating, given to URI by the Foundation for Individual Rights in Education, or (FIRE). Tarnowski hopes that his club can work alongside of Student Senate to help include free speech policies in the handbook, in order to promote freedom of speech and diversity of ideas. This club is interested in discussing its ideas with those who have similar and opposing views, like the URI College Democrats. Tarnowski is hoping to set up a conversation or debate with the College Democrats in a peaceful environment to discuss current political issues. During their first meeting, on Jan. 23, the club elected officers, all of whom ended up being freshman. The new Vice President is Delaney Burke, a Biomedical Engineering major, the Secretary is Lexie Duntzee, also a Biomedical Engineering major and the Treasurer is Abbi Dexter, a Health Studies major. Senate SOARC Chair Samantha King must submit a bill on Feb. 1 calling for the URI College Republicans’ recognition as an unfunded student organization. Since Student Senate is a non-profit organization and cannot give money to any specific political party, the group must be unfunded. After King submits this bill, Student Senate will take a week to read and analyze the bill and will vote the following week. The URI College Republicans will meet with the entire Student Senate on Feb. 8, at 6:30 p.m., to become an officially recognized organization. If they receive recognition, they will later determine the location and time of their meetings with hopes accommodate all members. The College Republicans are open to anyone on campus, regardless of their political view, and welcome anyone who is interested in politics.